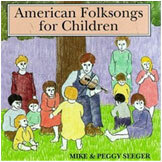 Mike Seeger - Store - Animal Folksongs for Children - and Other People with Penny, Barbara, & Peggy Seeger et al. Children and grandchildren of Ruth Crawford Seeger sing all forty three songs from her animal folksongs book, plus an extra fifteen, in a rich variety of voices, instruments, and sounds. Notable Children's Recording, American Library Association. Good listening for adults as well.